Random encounter, neighborhood street festival: minted cucumber lemon sorbetto ($4.80). (This venue is closed.) The portions are smallish, but many are potent. The green mango of tum mamuang ($8), for instance, is dressed with palm sugar, garlic, and dried chiles, whose various charms are conveyed throughout the heap by a sauce made from pickled fish. Underneath the mango is a bed of betel leaves, the same leaves employed in South and Southeast Asia to wrap paan. Assembled by a paanwala, a quid of paan is gently massaged between cheek and gum for its flavors and, often, stimulative properties, after which the weary leaf and its contents are usually expelled rather than swallowed. By contrast, eating this tum mamuang is a do-it-yourself affair. Fold a betel leaf around a little mango, much as you'd wrap lettuce around kalbi, then take it in a two bites or pop it in your mouth whole. Both leaf and mango can be chewed and swallowed, but watch your spice levels — that chile-laced fish sauce insinuates itself into the bed of betel leaves, too. For more photos from this backyard dinner (call to confirm when the outdoor space is open), see the EIT page on Facebook. (This venue is closed.) Kaya, a coconut egg spread, is a coffee-shop favorite in Singapore and Malaysia. Some versions are browner, owing to caramelized sugar, and jamlike in texture; some, such as the Thai-style sangkhaya in this khanom pan ping ($5), take a green color and faint herbal flavor from pandan leaves and have a very smooth, custardlike texture. 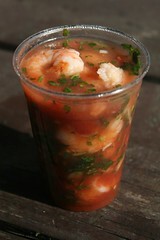 This uncaramelized style tends to be quite sweet, too, as you'd imagine. Pok Pok's pan-toasted "soldiers" were just precisely crisp enough to serve as swabbing utensils; the serving of sangkhaya was generous enough that every soldier got his due. Previously: In some obvious regards, my hoi thawt (at the time, $14) wasn't a ringer for the "broken crepe" served at Bangkok's expansive Aw Taw Gaw wet market. Pok Pok's was fresher-looking and considerably fatter, down to the individual mussel meats. Yet the hoi thawt held together, thanks to a minimal not-too-crispy batter, at least till I had at it. I don't know what hot sauce was served with that Bangkok hoi thawt, but one wouldn't imagine that Huy Fong sriracha sauce — the ubiquitous American-made "rooster" brand found in squeeze bottles throughout New York — would have many takers in Thailand. Possibly it was the well-balanced Shark brand sriracha, made in Thailand, and served at Pok Pok, too. Apart from somewhat soupy smoked pit beans (small side, $4), the textures in this DIY BBQ sampler were great. The ample meat on the baby back ribs (half-rack, $15), for example, didn't fall off the bone but came free readily with a light pull, while the brisket had a dramatically craggy crust (shown in the second photo below, $25 per pound) that safeguarded its tender flesh. But the brisket was underseasoned; once I'd swabbed a piece in Hometown's "sticky sauce," I didn't want to do without. Best over all was the smoked lamb belly ($24 per pound); even this could have used a touch of salt. Unfortunately, I arrived at the very tail end of sandwich time (weekend lunch only), so Hometown's lamb belly banh mi will have to keep. 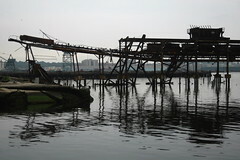 From my photo archives: the warehouse, and a detail of a pier, of the former Revere Sugar Refinery. 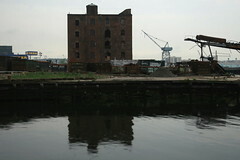 Both were demolished during the summer of 2009, two-and-a-half years after the demolition of the iconic refinery building itself. Even the meat-free sandwiches seem substantial. 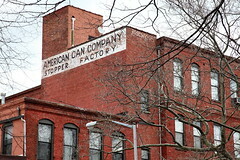 The American Stopper Co. moved to this former Chesebrough Manufacturing complex in 1903 and expanded the facility to accommodate its own growing business. 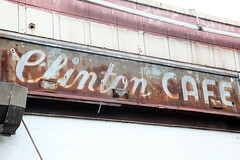 The company, which made tin containers for chocolate as well as many personal-care products, was acquired by the American Can Co. in 1915; the precise date of this sign is unknown. 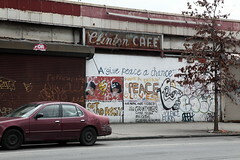 Today the complex is occupied by apartments and small businesses.